The College of Nursing and Health offers a four-year program leading to the Bachelor of Science in Nursing degree (B.S.N.). 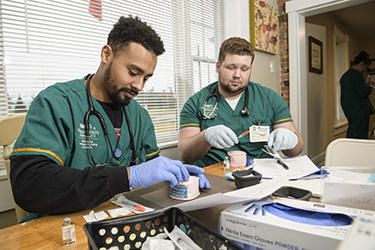 Wright State University-Miami Valley College of Nursing and Health is accredited by the Commission on Collegiate Nursing Education (CCNE) and is also approved by the Ohio Board of Nursing. Graduates are eligible to sit for the National Council Licensure Examination for Registered Nurses (NCLEX-RN). Nurses care for individuals and families from birth to death in local as well as international communities. Workplace environments can include newborn nurseries to elderly care facilities and school clinics to the World Health Organizations. A nursing education prepares you to participate in research to improve the health of people and/or improve health care practices. The college has contracts with over 200 agencies in the area including hospitals, rehabilitation centers, county health departments, nursing homes, school systems, senior citizens centers, and day care centers which can be used for clinical experiences and/or research. Students are introduced to the varied aspects of nursing through theory and research in the classroom. Outside the classroom, students will have clinical experiences in health assessment, maternity, pediatrics, adult health, community health, mental health and complex care settings. Nursing students complete over 950 hours in clinical practice, laboratory, and simulated settings. Based on space availability, classes and clinical experiences may be offered days, evenings or weekends. View Bachelor of Science in Nursing program information, all degree requirements, and graduation planning strategy in the University Catalog. All students admitted to the nursing program prior to Spring 2017 should review the posted undergraduate student handbook (PDF) for their pattern and program of study. Professional nurses provide care for patients with diverse and multicultural backgrounds and should represent those backgrounds. The admission process will seek applicants with evidence of intellectual ability, maturity, motivation, ability to interact with diverse populations, dedication to human concerns, ability to independently learn, ability to perform functions required in the practice of nursing, and potential for providing nursing services to underserved areas of Ohio. Provide evidence of no criminal history record on file from both a Federal Bureau of Investigation and an Ohio Bureau of Criminal Identification and Investigation (or applicable state) background check. Please be aware that background checks may take up to 30 days to process. It is to your benefit to complete the background check one month prior to the College of Nursing and Health application deadline. Background checks can be done in the Educational Resource Center at 116 Allyn Hall. The results must be sent to, College of Nursing and Health, 160 University Hall, Wright State University, 3640 Col. Glenn Hwy, Dayton, OH 45435. Admission to the College of Nursing and Health is competitive due to constraints of the affiliating clinical facilities and program resources. The most qualified applicants are selected based on the following criteria: achievement of a minimum score on the HESI A2 Entrance exam, admission prerequisite coursework GPA, cumulative undergraduate coursework GPA, criminal records check and interview. Be admitted to Wright State University as a matriculated (degree-seeking) student by February 15 of your senior year of high school. Offers of direct admission are sent in mid-March. Submit an intent to snroll form to the College of Nursing and Health Student Affairs Office, 160 University Hall by the following deadlines. All students must successfully complete a state-approved nurse'saide training course before entering the first nursing course (NUR 2100). This course must have been completed within two years of the application deadline unless the student is currently working as an STNA/CNA. In this situation, a copy of the certificate or course transcript, along with a letter from your employer verifying your current position and years of experience as an STNA/CNA will be acceptable. It is important that your certified nurse aide course lay a good foundation for the nursing program. Based on the skill set of previous students, we have found that some programs are preferable to others. Consequently, we encourage our students to enroll in a preferred course that will best prepare them for their first nursing course. This list is not exclusive; however, if you are considering taking your Nurse Aide course somewhere else, please call the College of Nursing and Health to make sure it will be accepted. All students must have a health status consistent with meeting program objectives and be capable of actively participating in all clinical experiences as certified by a physician or a nurse practitioner prior to entrance into Nursing 2100.